I started making Charlie his dog treats about a year ago after learning of his food allergies. Not only do I think he prefers fresh cookies, making my own treats is a way to control the ingredients, fat, calories etc. I usually try and mix up the recipes a little bit, but this one is simple, easy and he loves it. 1. Preheat oven to 350 degrees. 2. Mash banana with a fork until smooth. 3. In a large bowl mix all ingredients one at a time, kneading well after each addition. 4. Knead dough into ball and roll onto a floured surface 1/4 inch thick. 5. Cut with the cookie cutter of your choice.6. Place on your prepared cookie sheet and bake for 15 to 20 minutes, until edges browned. Cool and refrigerate. 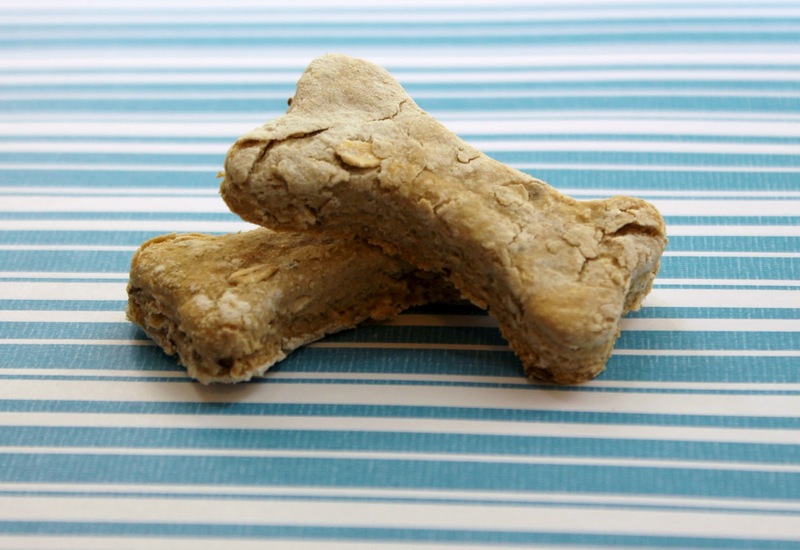 Yields 4 – 5 dozen dog bones. *Note: If you want a “shinier look,” you can also brush a thin coat of egg whites on the cookies before baking them. These also make for a cute gift to other fur parents! Wow – great idea! I want to try these. Am curious-do you think it's cheaper to make your own than buy? Obviously it's a lot healthier! You are such a good dog mommy Christina! I'm totally going to make these for Wrigley! Too cute! I can't wait to make these for my Daisy!!! Thanks for sharing. I should make these for Bailey and see if she likes it better than her current favorite chewy store bought treat! Best recipe I have seen thusfar this will be for my Chi Pin. Will half honey half molasses spot of maple syrup .